Today marks my 30th birthday. As I begin a new decade of my life, I hope to write more and improve myself. This blog post is an attempt to achieve both and to speak openly about an important part of who I am. Six years ago I was extremely depressed and sought help. This was something that was building for years, if not my entire life. Large parts of my childhood and early adulthood were saturated by depression. Growing up on a farm meant geographic isolation and limited social interactions. When my parents were away or working, I was often left with my brother, who had a habit of being rough with me. One reminder of this is the pencil lead that is forever cemented in my right knee. I n response, I acted powerlessly to avoid future harm. This feeling of powerlessness deprived me of my voice and confidence–two pieces of my life I am still struggling with today. This was the start of feeling isolated mentally in addition to geographically. I was unable to talk to my parents or anyone else about this or anything else I was experiencing. So, around my parents and family, I repressed my emotions and was left alone. Even when I was surrounded by family or friends, I always felt isolated, talking to myself rather than to others. I was often told to stop being “so shy”, to do what everyone else was doing. Except I didn’t have the tools to socialize. I was interrogated for being different. This lack of emotional connection made me unsure of who I was or what I was meant to do. Being a child in a household that doesn’t discuss emotions was extremely stunting for me. Most of my memories as a child revolve a single sensation: numbness. This made interacting with others, especially strangers, extremely difficult and stressful for me. For example, I sometimes would stay at my grandma’s house, sleeping in her living room. If she had a guest over in the morning and I woke to hear them, I would often force myself back to sleep to avoid meeting whoever it was. This habit of extended sleep, first used as a coping mechanism, remains with me today. Even at school, I never felt comfortable in social situations. I watched the world pass by but I never felt a part of it. Everyone seemed to be enjoying life, making friends, having relationships and growing up. But not me. I was angry at the world for my fate and would lash out at others to cope; I never had an outlet to solve my underlying mental health needs. When I moved to Edmonton at age 17 and started my new life at university, my depression followed me. Going my teenager years without a single romantic relationship left me with a deep emotional scar; a scar that would haunt me for a further 5 years of university. I would often be at home and convince myself that this would be my life forever: alone. Living by myself, away from campus, during these years is one of my biggest regrets. (I have many regrets in life thanks to my depression.) One of the consequences of having depression for so long and having few positive memories from those years is that I now have a stunted ability to recall memories. of whom stayed with me through early adulthood. They helped me to feel normal, even though I never truly did. Unfortunately, as the years went by, they moved on–as people do. They gained new friends; I didn’t. They made lasting relationships and eventually got married; I didn’t. They created lives for themselves. I was trying to figure out mine. Alone. I graduated in 2010 and started working at a typically office job. My depression lingered. I had some friends who I played soccer with but that eventually stopped and, in late 2011, I found myself alone. More alone than I’d ever been before. I spent weeks going home to an empty, cold box. I spent entire weekends indoors, talking to no one but myself. At the age of 23, I had reached my worst mental state. I felt like I had no friends. I had no relationships. No feeling of engagement. So, I made an appointment at a psychologist’s office. It would be the single most important decision of my life. Through weekly counseling sessions over many months, I would eventually learn about a condition that explained everything about me: social anxiety. I never knew about this condition growing up. I never met with any mental health professionals before then. I never knew that there were other people in the world like me. It was a painfully difficult and liberating revelation. I now had a condition for why I thought the way I did and why I acted the way I did. And also a way to frame my depression. I could now explain why I often lied as a way to avoid interactions. For example, saying I was going to the gym (which I wasn’t) to avoid going to a party. It was a way to avoid future social anxiety. It explained why even when I worked up the courage to do something, like join a group, I would escape at the last minute, as I often do today. It’s difficult to explain how powerful my mental health therapy was, but I can try to explain by the results. After the first few months, I started dating for the first time. This alone creating a level of confidence that was missing from my entire childhood and university years. I finally felt like I could be loved and that I could find a partner. The second big change was that I finally was able to express myself. I could talk about all of those emotions I had buried away collecting dust. I cried more in those sessions that in my entire life. Talking to someone, without fear of judgement, freed me to think about who I am and what I wanted to do in life. I was very unhappy with my job and wanted to do more. These thoughts led me to sign up for a volunteer abroad scheme with Engineers Without Borders–a group I always thought was too adventurous for me. But I was selected and went abroad in 2012 for the first time under my own choice. It was further liberating to travel and make my own path in life. Because I went away travelling, I stopped visiting my therapist. This meant that I was left to return to my own thoughts again. 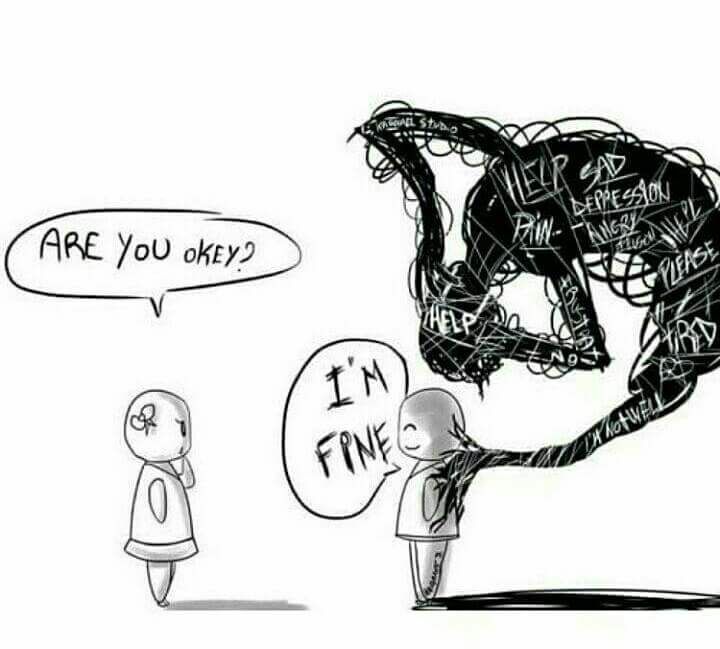 But even without a therapist, I have been able to better express my state of mind, to explain my social anxiety to others and to recognize my depression. It has taken me six years to return to therapy, which I started for the second time last month. In those past six years, I visited new lands, joined new groups, made new friends and studied abroad. More importantly, I met Sarah, who had become my best friend and the person I hope to spend my life with. Meeting her is thanks to my improved mental health and all that it was able to help me achieve. One ultimate truth I have learned is that I will likely always have anxiety and depression. They are conditions I can manage, similar to diabetes, but conditions that can not be cured. Although I have some tools for improving my mental health, I am trying more to look at what others have done. At some point last year, I came across an essay by Dr. Steve Bearman titled, “Depression, Anxiety, and the Mismanagement of Aliveness”. This short piece was able to unite the two parts of me–anxiety and depression–and explain them in terms of a single spectrum. Dr. Bearman explains anxiety as “more aliveness than you can handle” and depression as “aliveness shut down”. This creates a spectrum of “aliveness” which spoke directly to me and my condition. I could now see each day as a balancing act between between high and low aliveness, between anxiety and depression. Dr. Bearman further describes the manifestation of these through five components: Energy, Emotion, Meaning, Engagement and Relatedness. Social anxiety disorder is sometimes referred to as an “illness of lost opportunities” and these types of self-deprecating thoughts have prevented me (and likely many others) from achieving happiness through socializing. 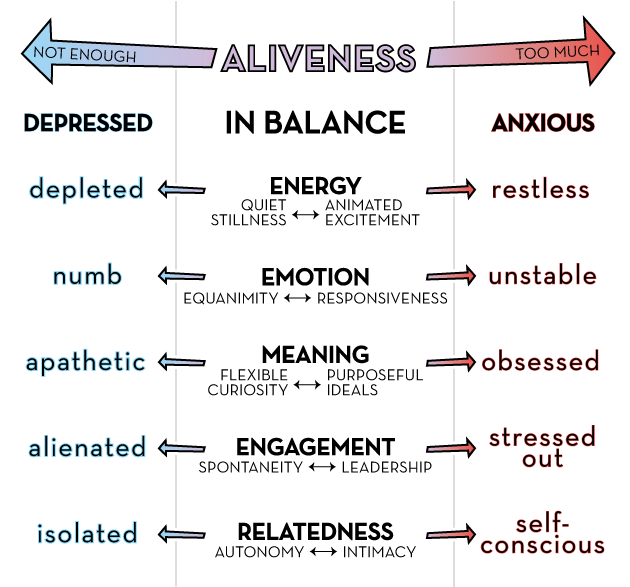 I found this spectrum of “aliveness”–moving between anxiety and depression–helpful in explaining why I always feel like I’m moving through highs and lows. When I go out and socialize, my mind is filled with anxiety about what I’m saying, what I’m doing, or thinking about what others might view of me. 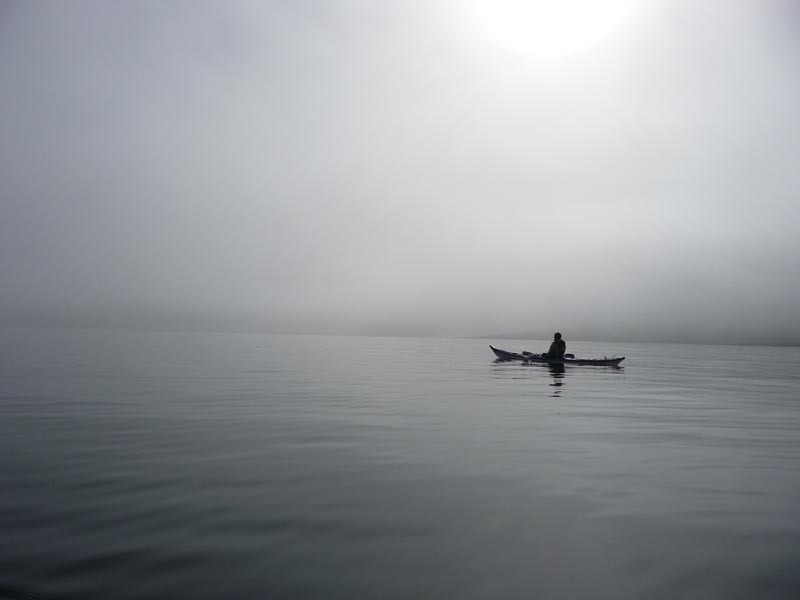 When I return to an isolated, I often have to manage depressed thoughts about my past, present and future–often focusing on regrets. This see-saw effect has been with me my whole life and I expect I will only be able to manage both states to a more comfortable level. I am hoping that sharing my story will reduce my shame about my past and allow me to grow into the person I know I can become. I am hoping that sharing my story may lead to others doing the same so that, together, we can eliminate the stigma around mental health and those who suffer. I’m not alone. You’re not alone. Anyone can live with depression. Finally (and most importantly) I am hoping that other people seek help from mental health professionals. We all have regrets, unique conditions or things we wish were better. It makes sense to go to the doctor when we have an injury. But if we live with an injured brain, we are afraid, unable or without help to get better. It saddens me to think of the people that could be helped with easily accessible health care. If I would have had some as a child, my emotional scars could have been healed at a much earlier age. And I could have done so much more and been happier in my earlier years. Happy 30th Birthday Spencer. You are to be commended for your honesty and vulnerability. Your story is bound to help others who are dealing with the same issues. Please continue to share your story – it is one worth telling. All the good you have done for others is a testament to the strong man you have become. At 23 I can completely relate.